+ Raise Awareness. Increase Influence. Build Success. The Chicago Network is the leading organization of Chicago’s professional women who have reached the highest levels of achievement in business, government, academia, and the arts. Through research, programming, partnerships and thought leadership, The Network seeks to expand opportunities for the advancement of women. By identifying key workplace challenges and celebrating successes, The Network strives to raise awareness among men and women, break down barriers, and inspire the next generation of women. Since 2004, Melcher+Tucker has collaborated with the executive director to identify key issues, shape leadership messages, and conduct local and national media outreach. We have developed an experts list of Chicago Network members for major news organizations locally and across the country. 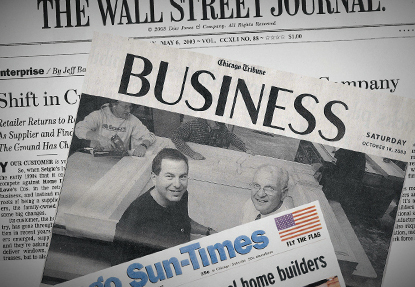 MTC has assisted with writing and placing opinion pieces in influential Chicago business publications and in such national journals as Directorship and Directors Monthly. We also have managed the editorial process for the release of the annual Census Report, developing key messages, writing content, working with the graphic designer and overseeing all media outreach. Through carefully targeted media outreach – story placements, Op-Eds, TV and radio interviews – we have helped The Chicago Network achieve key objectives: to broaden public understanding of its mission and the role of women in the workplace. The Census Report, and more recently a research partnership with Crain's Chicago Business, have become a vital resource for data and analysis for senior managers, directors, and researchers, and has been featured in the Chicago Tribune, the Chicago Sun-Times, Crain’s Chicago Business, and on Chicago Public Radio and WTTW's Chicago Tonight. The Network’s CEO is a trusted resource, locally and nationally, on issues such as women’s advancement in the workplace, next generation talent, and paying it forward. Rising awareness and perceived value of The Network also has led to a growing number of media and other partnerships and increased attendance at public and member events. Seigle's, Inc., one of the country’s largest regional manufacturers and distributors of building supplies, embarked on a strategy to focus predominately on the professional builder, shifting away from direct-to-consumer sales. Deciding not to compete with the big-box retailers, Seigle's concentrated on building relationships with both local and national homebuilders, and began preparing for its largest acquisition, a deal, which would cement its strategic change of direction. Yet, the $260 million, family-owned company based in Elgin, IL, lacked significant visibility and for its new strategy and branding. Melcher+Tucker Consultants began a comprehensive engagement to help define the company’s brand proposition and carry out strategic positioning to raise Seigle's profile among key constituents. Media relations activities included targeting local and national trade and general interest publications, aimed at promoting the new corporate strategy; establishing Seigle's executives as knowledgeable sources on industry and economic issues; and, highlighting distinctive policies such as corporate governance. MTC also helped develop a series of customer forums and accompanying monographs designed to increase awareness and credibility, and rewrote all of the website content. Seigle's new strategy was featured in major profiles in papers ranging from the Chicago Tribune and Wall Street Journal to the New York Times and throughout the industry’s leading trade journals. Owner-brothers Harry and Mark Seigle authored columns, and became regular sources for industry stories. In less than 18 months, MTC helped Seigle's convey its key messages to its core audiences. In September of 2005, Seigle's was sold to Stock Building Supply near the height of the housing cycle. JPMorgan Chase, one of the world’s largest financial institutions, began planning its first “Community Partnership Report,” a publication that was to demonstrate to employees, investors and other stakeholders the firm’s commitment to support “healthy, vibrant communities where we live and work,” in the words of former Chairman Bill Harrison. With operations in 50 countries, the challenge was to select case studies that represent the firm’s interests in community revitalization, public education, and arts and culture – and, to write the profiles in an analytical style similar to that in the best news magazines. The Community Partnership Report was distributed to JPMorgan Chase stakeholders around the world, and made prominently available on its web site. The report was widely praised for its breadth of coverage, stunning photographs, and, perhaps most important, crisp and sensitive writing that illustrated the firm’s impact on communities it serves. OWP/P l Cannon Design is a leading architecture, design and engineering firm specializing in healthcare, education and corporate/commercial design. Operating as OWP/P, before its merger with Cannon Design, the firm, with offices in Chicago and Phoenix, sought to raise its visibility both locally and nationally for individual architects, specific projects and other areas of expertise in an effort to distinguish the firm’s work and ideas. Melcher+Tucker Consultants began the engagement assisting industry leadership teams in developing internal messaging for the roll out of a new strategic plan. We then worked with each of the firm’s practice leaders and marketing coordinators in Chicago and Phoenix on a range of activities, from media training and writing press releases to story development and promotion of people, new projects, special programs, and trends, both to Chicago-area and national trade and general-interest media. We also were involved in developing the messages and media plan for the firm’s 50th anniversary celebration held in Chicago’s Millennium Park. Throughout, we positioned leaders as expert resources on projects and trends, including sustainable design, healthcare technology and prototypes for new schools. The firm, its innovative approach to design and its leaders have been featured in profiles in such major media as FastCompany (where we also launched an education design blog), the Wall Street Journal, the Chicago Tribune, the Chicago Sun-Times, WTTW’s Chicago Tonight, Chicago Public Radio, and Architect. OWP/P, which merged with Cannon Design in 2009, is a global leader in both its operating approach to architecture and its delivery of built work across a range of industry sectors, with widespread awareness of its brand and operating philosophy.